Although this Chili and Wild Blueberry Salad recipe post is sponsored by Nature's Touch™ Frozen Foods, all opinions are my own. If you are like me and love to add a little flair to your menu, you will love this Chili and Wild Blueberry Salad with a Raspberry Lime Vinaigrette. 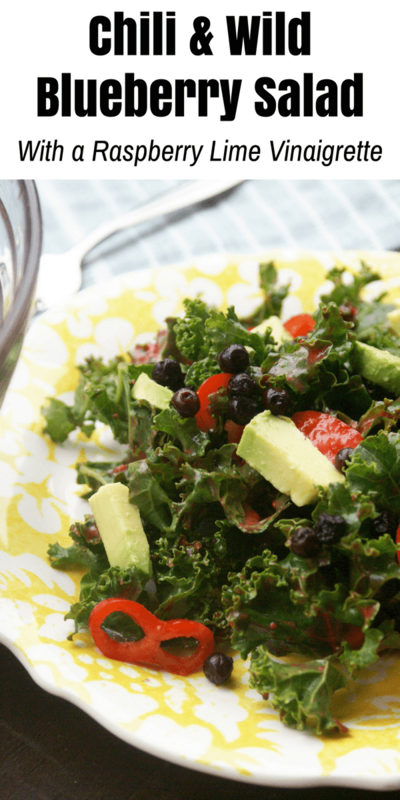 This salad is easy to put together and is absolutely delicious. For this Chili and Wild Blueberry Salad we used Nature's Touch Organic Raspberries and Nature's Touch Pesticide-Free Wild Blueberries, purchased at ShopRite. Nature's Touch makes it possible to have fresh fruit and veggies on hand year-round with their line of organic and pesticide free frozen fruit and veggie products. We shopped at ShopRite for our Nature's Touch products, but they can also be found at Shaw's and Big Y. (Please note that Big Y only has Nature's Touch organic frozen vegetable products). I choose to use Nature's Touch products because they offer organic and pesticide-free fruits and veggies, sourced from around the world, picked and packed at the height of their freshness. Having them stocked in my freezer makes it easy to always be able to add a little bit of fruit in my cereal, make smoothies, or prepare tasty recipes such as this salad. Pro Tip: Keep your freezer stocked with Nature's Touch frozen fruits and veggies so that you always have them on hand when you need them for a recipe. Now let's get to that tasty recipe I was telling you about earlier. 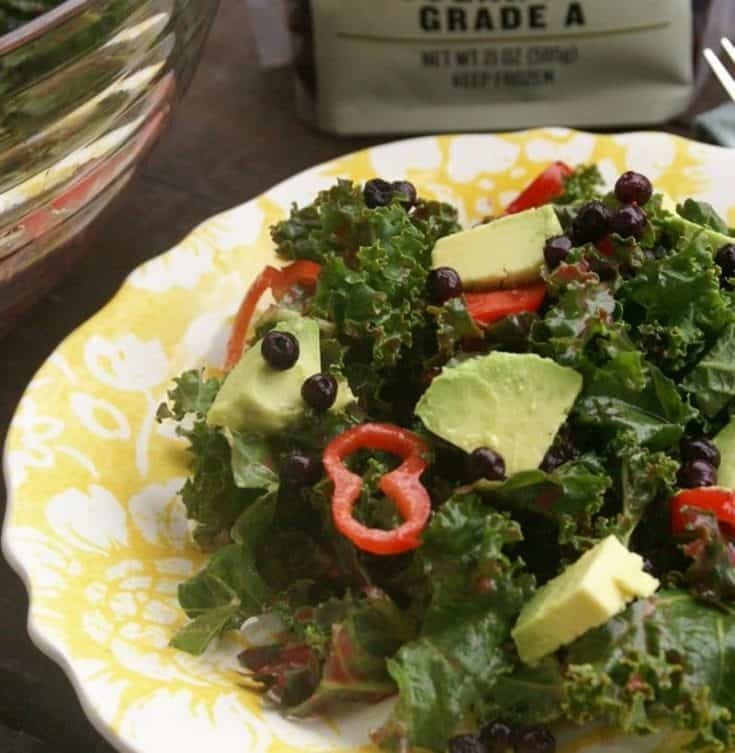 This kale salad is topped with red chili peppers, Nature's Touch Pesticide-Free Wild Blueberries, avocado, and paired with a delicious Raspberry Vinaigrette. The salad can be thrown together in no time, and is perfect for lunch or for serving at a party. 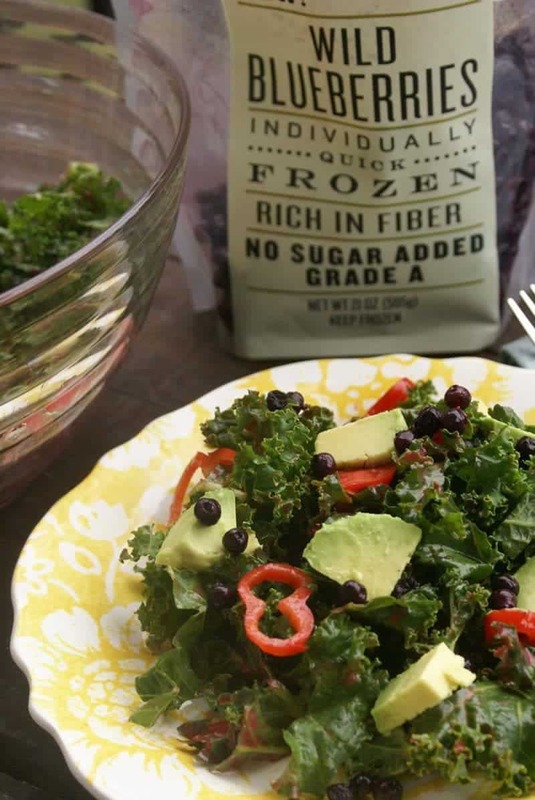 This kale salad is topped with red chili peppers, blueberries, avocado, and paired with a delicious Raspberry Vinaigrette. The salad can be thrown together in no time, and is perfect for lunch or for serving at a party. Place all dressing ingredients into blender and pulse until well blended and a liquid consistency has been reached (raspberries should not be intact). 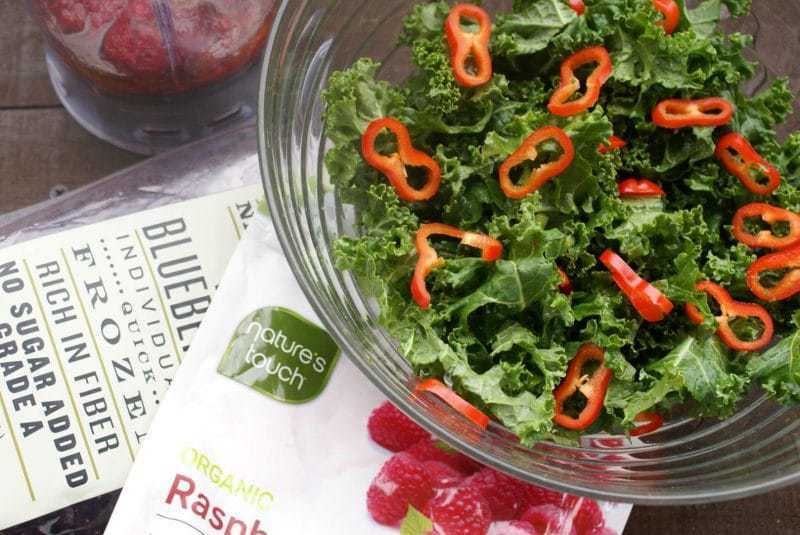 Place kale, sliced chili peppers, and blueberries in a medium sized bowl. Add raspberry vinaigrette on top and mix well. When ready to serve, add avocado pieces on top of each salad to finish. After enjoying your Chili and Wild Blueberry Salad with a Raspberry Lime Vinaigrette I would love to hear what other Nature's Touch recipes you come up with. Drop us a note in the comments section below. This is great. You have a great recipe. Thanks for the recipe. Sounds really good, I will have to try it. Looks absolutely delicious. Great for a summer day!